MBABA MWANA WARESA is the Zulu Goddess of rain, agriculture, and the harvest. 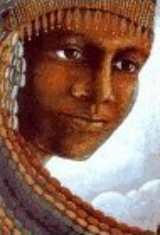 She is one of the most beloved Goddesses of Southern Africa, largely because she is credited with the invention of beer. Mbaba Mwana Waresa is also the Goddess of rainbows, a symbol of the link between heaven and earth, the Gods and man. Mythology says that she could not find a suitable husband in heaven, so she came to look on earth. She came across a herdsman named Thandiwe, whose song moved her so much that she chose him to be her companion. Being mortal, he had to face many tests to prove himself, but he was at last accepted by Mbaba Mwana Waresa as her husband.